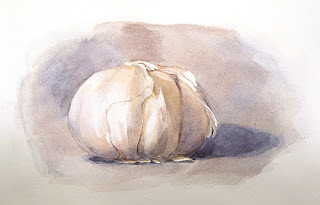 Today, we are going to look at how to use masking fluid in watercolor while working on the bulb of garlic that we did in last week's watercolor basics post. One of the things we can do with the masking fluid is create really neat and clean highlights. This is because masking fluid can cover any shape and size of area on the painting, even for really tiny areas. 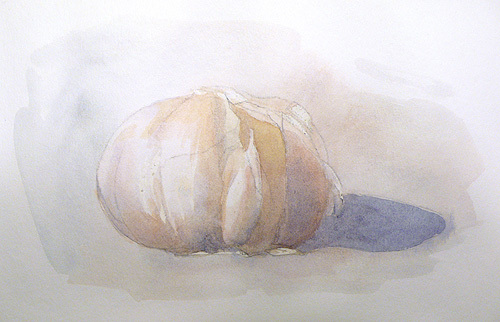 It is a really versatile tool when it comes to watercolor painting. 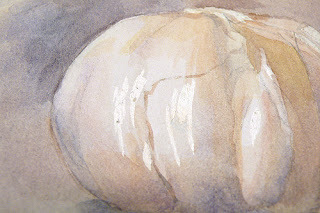 Let's look at how to use masking fluid in a step by step demonstration of this painting. 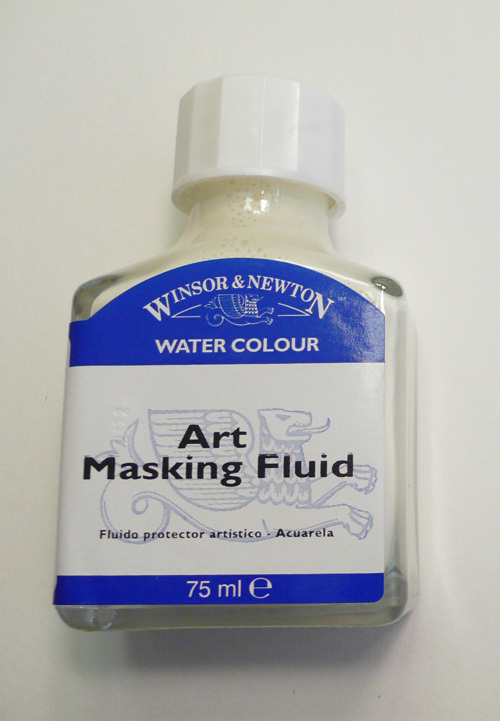 There are many brands and kinds of masking fluid that you can buy. 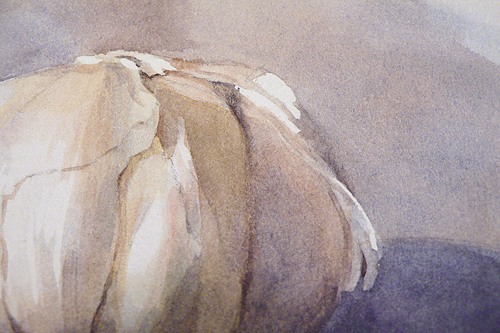 Some masking fluids are white and some are tinted with yellow so that you can see where you apply your it on the watercolor paper. I am using Winsor &Newton Art Masking Fluid. For applying masking fluid, I recommend using a brush that you would not care if the brush gets ruined. The masking fluid dries fast and sometimes it is hard to remove from the brush once it is dry. 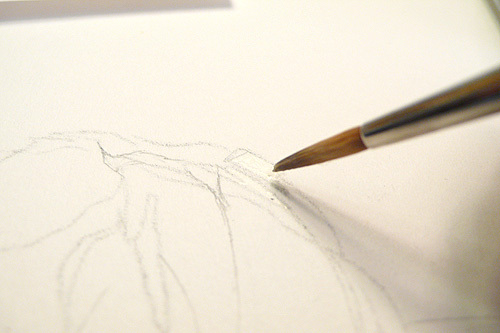 Do not use your expensive sable brushes to apply masking fluid, use cheap brushes or old brushes. The eraser is to remove the masking fluid. Actually, you can use your fingers to remove the masking fluid too, but I prefer an eraser pencil so that I can control the area I am removing the masking fluid better. 1. 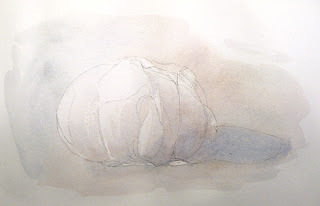 Start with the sketch on a piece of watercolor paper. 2. 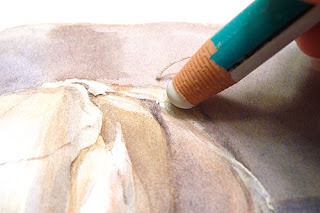 Apply the masking fluid with a thin brush. 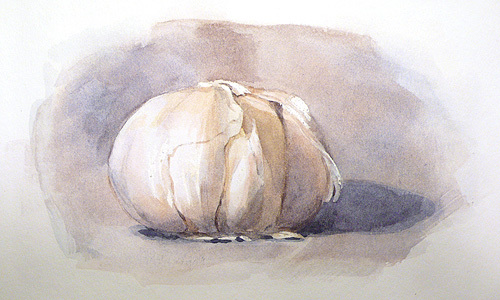 With this painting, I am using the masking fluid to mask some of the highlighted areas of the garlic. 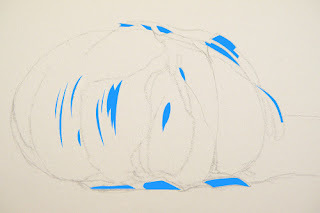 In the picture to the right, the blue areas are the areas that I am going to put masking fluid on. Apply the masking fluid carefully. 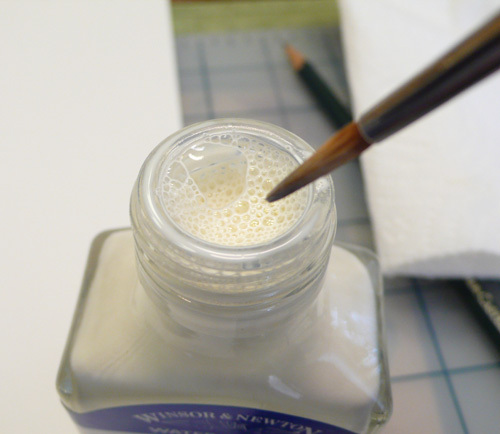 Right after you finish applying the masking fluid to all the areas, clean your brush with soapy water. Wait for it to dry. It will not take long to dry, usually about 1-2 minutes. Wet the whole paper with clean water, and start the first wash using the wet-in-wet technique. Wait for it to dry. 4. Apply the second wash.
With first two washes, we do not need to worry about the details. 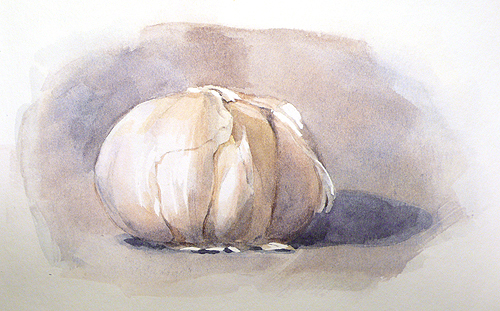 Focus on the overall values and the form of the garlic. 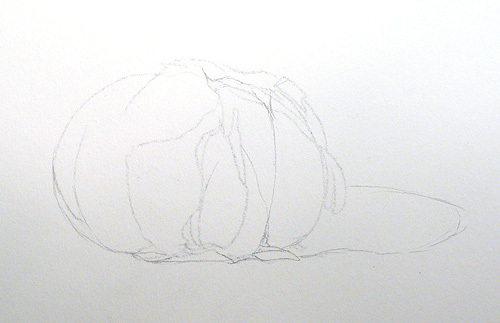 Work on the object and the background together. 5. Apply the third wash.
On the third wash, only wet the background area with clean water and paint a wash to make the background darker. 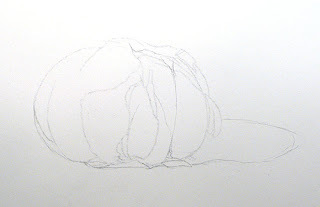 Paint the shadows of the skin, folds, and creases. 7. Paint the edge of cast shadow. Where the object touches the table is usually a lot darker. Paint the edge to darken this area of the cast shadow. Wait for the whole painting dry. It is really important to wait for everything to dry first and then remove the masking. If any area is still wet we risk accidentally rubbing it off, or you might dirty your painting. 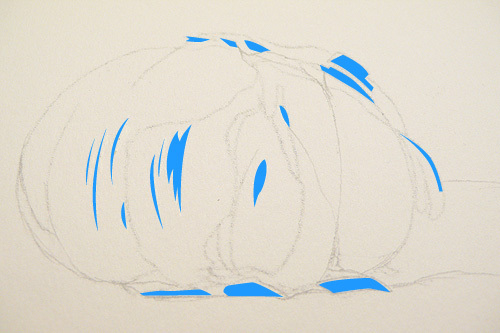 Remove the masking with an eraser, rubbing the mask gently until all the masking is removed. 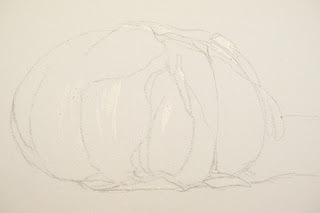 To the right is a detail of the painting of after the masking fluid is removed. Notice how nice and neat the areas look. Here is the painting after removing the masking. 9. Add the final touches. After removing the masking, I felt that bottom skins were too bright, so I applied another coat of gray to make it darker. Now, it is finished. 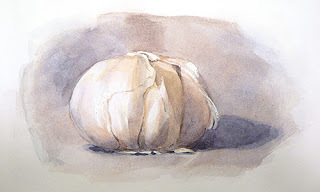 Masking fluid is good for areas that are small or odd shaped. It can achieve a shape that is hard to cover with masking tapes. It can create clean edges and bright highlights. 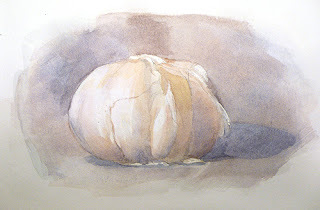 Using masking fluid is a handy technique to know for watercolor painting. Thank you for this! I was looking for a good explanation of how to use masking fluid. I feel more confident now.